The CAP theorem is a tool used to makes system designers aware of trade-offs while designing networked shared-data systems. CAP has influenced the design of many distributed data systems. It made designers aware of a wide range of tradeoff to consider while designing distributed data systems. Over the year the CAP theorem has been widely misunderstood tool used to categorize databases. There is much misinformation floating around CAP. Most blog posts around CAP are historical and possibly incorrect. It is important to understand CAP so that you can identify a lot of the misinformation around it. The CAP theorem applies to distributed systems that stores state. Eric Brewer at the 2000 Symposium on Principles of Distributed Computing (PODC) conjectured that in any networked shared-data system there is a fundamental trade-off between consistency, availability, and partition tolerance. In 2002 Seth Gilbert and Nancy Lynch of MIT published a formal proof of Brewer’s conjecture. Consistency – A guarantee that every node in a distributed cluster returns the same, most recent, successful write. Consistency refers to every client having the same view of the data. There are various types of consistency models. Consistency in CAP (used to prove the theorem) refers to linearizability or sequential consistency a very strong form of consistency. Availability – Every non-failing node returns a response for all read and write requests in a reasonable amount of time. The key word here is every. To be available every node on (either side of a network partition) must be able to respond in a reasonable amount of time. Partition Tolerant – The system continues to function and uphold its consistency guarantees in spite of network partitions. Network partitions are a fact of life. Distributed systems guaranteeing partition tolerance can gracefully recover from partitions once the partition heals. The C and A in ACID represent different concepts than C and in A in the CAP theorem. CP (Consistent and Partition Tolerant) – At first glance, the CP category is confusing, i.e., a system that is consistent and partition tolerant but never available. CP is referring to a category of systems where availability is sacrificed only in the case of a network partition. AP (Available and Partition Tolerant) – These are systems that are available and partition tolerant but cannot guarantee consistency. A Venn diagram or a triangle is frequently used to visualize the CAP theorem. Systems fall into the three categories that depicted using the intersecting circles. The part where all three sections intersect is white because it is impossible to have all three properties in networked shared-data systems. A Venn diagram or a triangle is an incorrect visualization of the CAP. Any CAP theorem visualization such as a triangle or a Venn diagram is a misleading. The correct way to think about CAP is that in case of a network partition (a rare occurrence) one needs to choose between availability and partition tolerance. Instead of choosing two is more like choose one. In any networked shared-data systems partition tolerance is a must. Network partitions, dropped messages are a fact of life and must be handled appropriately. Consequently, system designers must choose between consistency and availability. Simplistically speaking a network partition forces designers to either choose perfect consistency or perfect availability. Picking consistency means not being able to answer a clients query as the system cannot guarantee to return the most recent write. This sacrifices availability. Network partition force nonfailing node to reject clients request as these nodes cannot guarantee consistent data. At the opposite end of the spectrum being available means being able to respond to a clients request but the system cannot guarantee consistency, i.e., the most recent value written. Available systems provide the best possible answer under the given circumstance. 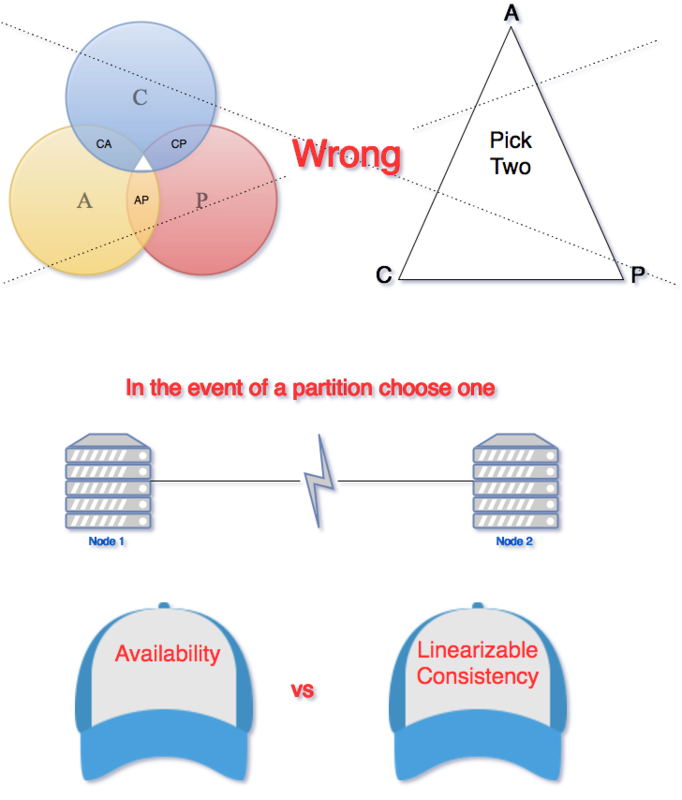 During normal operation (lack on network partition) the CAP theorem does not impose constraints on availability or consistency. The CAP theorem is a simple straw man to make system designers aware of trade-offs while designing networked shared-data systems. 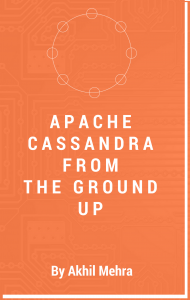 It is a simple starting point and has been widely used to design and discuss tradeoff in NoSQL database.